This week’s Photo Challenge is Urban. This entry was posted in Photography, Travel and tagged City, New York City, Photography, postaday, postaweek, postaweek2012, Puerto Rico, San Juan, Snow Storm, Urban, Weekly Photo Challenge. Bookmark the permalink. I’m not sure which I like better. The second feels more ‘urban’ to me, the other hints at too many other things. Both well done. both of them exude urban life! summer and winter urban shots! cool! Nice, nice ,both very nice, I especially like the first one. The power lines, the truck blocking the street and shipping lanes in the background have the feel of Urban to me. You’ve obviously examined it very carefully! :-) Yes, I like these kinds of complicated, even chaotic, urban scenes…. the tangle of overhead power lines is especially evocative! 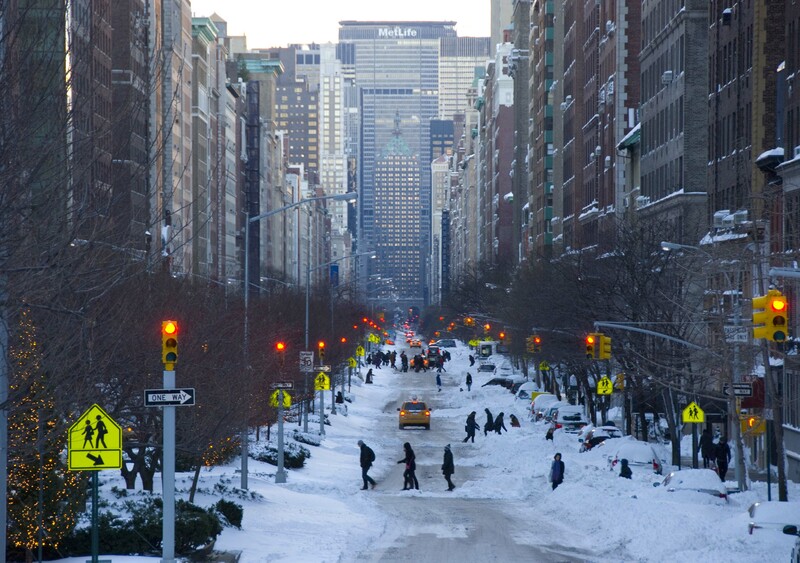 NY in snow and sun – lovely! Yes, I heard that too – harsh and brutal winter ahead of us. Last year was unbelievable with one major snowstorm in October, remember? I love these photos. Definitely urban. Especially the second one, about as urban as it gets! Thank you, and thank you for subscribing to our blog! Two excellent and diverse views of the urban landscape. Well done! What a wonderful contrast between two fantastic urban scenes! Beautiful urban shots Vlad! Appreciate the pingback. You are most welcome, Madhu—I really liked “The Barrio of Kitsch”! I like the contrast of the photos, really nice shots. These are perfect urban images! As are yours—just saw them! Really like how the traffic lights in the second one sort of guide your eyes into the picture…nice shots. Yes, and they are all red! Nicely synchronized (hopefully they will all turn green eventually…)! What a terrific winter shot with down toward the Pan Am building. (OK, MetLife building) with all the red lights, silhouettes walking and sliding about and the single cab. Wonderful! Every winter, once or twice at least… just have to get out there with the camera the next day while it’s still nice and snowy! very nice Manhattan with the snow ! I could get vertigo looking down the street in that first shot :-) Nice ones for the challenge. I’ve been to Old San Juan. Great picture!!! Love your own “Urban” shots :-) Thanks for following our blog! don’t know where that first shot is from but LOVE the shot of Park Ave and the Pan Am (I mean, the Met Life) building in the snow. 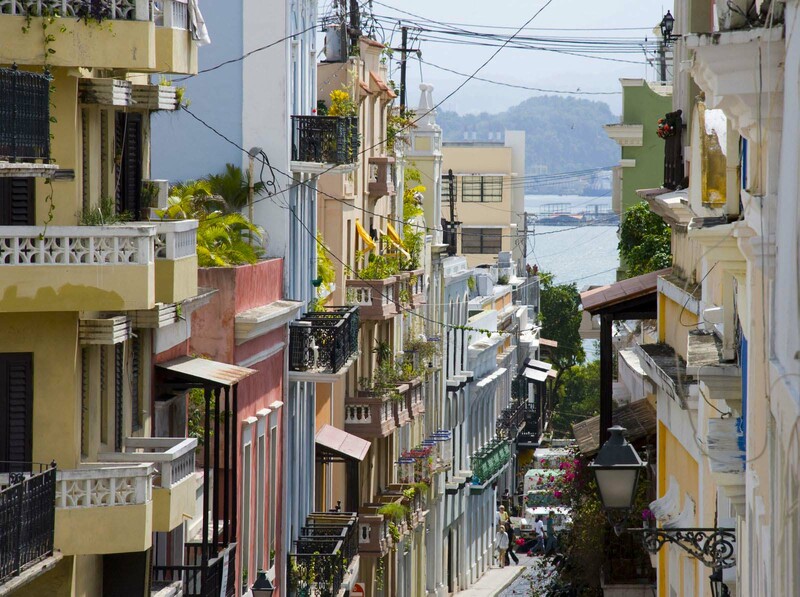 The first shot is from far away from any snow… San Juan, Puerto Rico. Like. (Your Like button wouldn’t let me Like this post because it said I wasn’t logged on, even though I am.) Nice pics. You caught the spirit of the day. It happens every winter. Of course, Park Avenue (in the second photo), in the heart of the upscale Upper East Side, is one of the first streets to be cleared of snow. The outer boroughs sometimes wait for days…. Nice contrast in photos, I love both cities! Beautiful! These are gorgeous! They should be framed.